ImportantGoogle Chrome is the recommended browser for Pinnacle. Firefox is also compatible if more than one window is needed. This document contains tips for using the new Pinnacle web application. The purpose is to highlight differences in the web interface from the desktop version. For more details about navigating and searching in Pinnacle, please see the Pinnacle Navigation Overview. Here are some of the differences you'll notice when navigating the Pinnacle web application vs. the desktop application. Breadcrumb navigation helps you not get lost by leaving a trail to get back. The right-most item in black is where you are. The blue links to the left take you back to the previous pages. The navigation menu is located at the left of the screen. 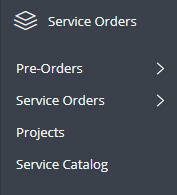 Hoverover Drop-Down menus replace pull-down menus. Clicking on record links and the "edit" button replaces action buttons. Remember to Save before moving on. There are fewer warning messages to save before leaving a page. You may be often be searching for the same criteria. Saving your search criteria allows you to quickly search on it later by selecting in from the Saved Search dropdown list. If you get lost or stuck, use the Advanced Search icon to get back . Search results default to 15 per page. You can change the number of results displayed up to 250 per page. Click the left and right arrows to go to the next record within your search.